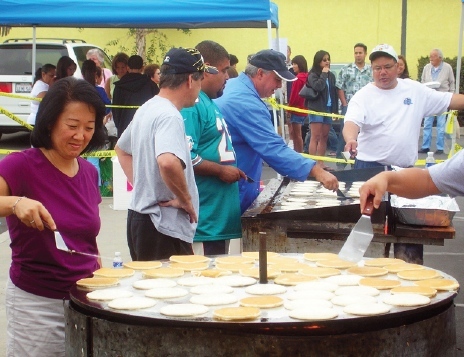 Team moms and coaches will flip more than 3,000 pancakes for the Hawaiian breakfast coming Saturday, Oct. 8, at the Southeast Japanese School and Community Center. NORWALK — The 23rd annual Pancake Breakfast and Holiday Boutique will be held on Saturday, Oct. 8, at the Southeast Japanese School and Community Center, 14615 Gridley Rd. (at Excelsior) in Norwalk. This is a breakfast done Hawaiian style with ample servings of pancakes, eggs, and a scoop of rice to go along with the Portuguese sausage and pineapple. Breakfast is served from 7 to 11 a.m. Tickets are $7 and include a chance to win a $100 raffle prize. Parking is available on the premises. After a hearty breakfast, get an early start on your Christmas shopping and visit the Holiday Boutique in the gym from 8 a.m. to 2 p.m. Peruse the fine selection from jewelry, clothing, quilts, to ceramics and much more from over 40 Southland crafters. Let them help you find the perfect gift for your family and friends. Cash, checks and credit cards accepted. Stop by the Holiday Kitchen and treat yourself and your family to a delicious gourmet lunch and/or dinner prepared by master chef Johnson Long. Fresh from the wok is the chef’s famous Orange Chicken and his delectable Honey Barbecue Pork. For a quick snack, or for the kids, take home a longtime favorite, teriyaki Spam musubi. Where else can you go to get breakfast, lunch, dinner and Christmas shopping done in one day? Come to SEJSCC next Saturday — you’ll be glad you did. Proceeds from the event benefit basketball and judo youth and scholarship programs. For information, call (562) 863-5996 or go online to www.sejscc.org.